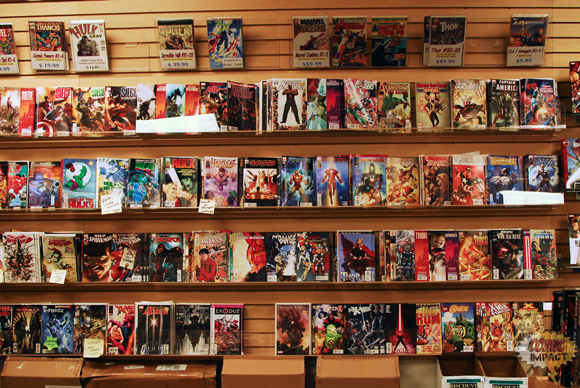 We started a new feature here at Comic Impact a few months back ,The ComicImpact Store Spotlight. Every month we will turn our magnifying glass on a local store (local can mean local for you the comic fan as well!). We then contact the owner and ask a few questions and even throw some pictures up on the site!! Sweet! Right? Well wait it gets better. We also decided that every POW(PICK OF THE WEEK) for that month that we record that we will mention the store of that month.. for the entire month! Now here is the important part where you, the reader can get involved. We want to know about your store! We want to know what stores in you area there are that you feel deserve to be spotlighted! Send us some suggestions as well as some reasons why you feel your store deserves it! We will pick from those at the end of the month to get the new store each month!!! This month we’re taking a look at Pulp Fiction in Long Beach. 1. Tell us a little bit about your store. At Pulp Fiction, our brick-and-mortar store, we pride ourselves on great customer service as well as Long Beach’s biggest selection of trade paperbacks and back issues bar none.Additionally, our online store at www.cheapgraphicnovels.com boasts the world’s lowest prices and biggest selection of graphic novels, trade paperbacks, and hardcover books. 2. How long has your store been open? 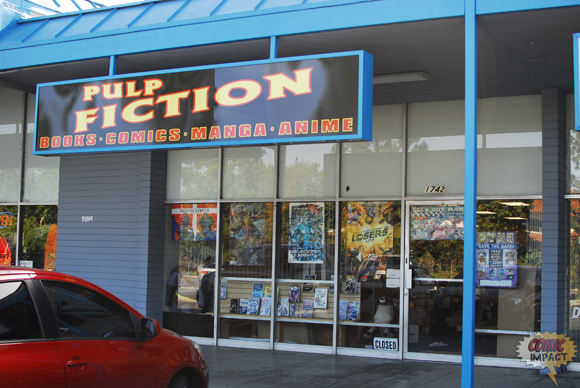 Pulp Fiction has been around for about six years (almost one year in our current location) and www.cheapgraphicnovels.com was launched only a few months ago. 3. Do you have any special events? 4. Do you have any special deals? Do we have deals?We have tons of deals!First of all, we have our pull service.Anyone who pre-orders 5 or more books a month instantly gets 10% off all of their monthly comics, even if they grab more off the shelf that they didn’t preorder.When a customer pre-orders 20 or more books a month we bump them up to a 20% discount.Customers can also add or remove books at a moment’s notice and we often offer discounts on other items like action figures and statues to our loyal pull customers. Secondly, and more importantly, we offer 40% off all graphic novels, trade paperbacks, and hardcover books from Marvel and DC every single day.We have similar discounts for all of the smaller publishers including 35% off Image and Dark Horse.For anyone not in the area, our webstore at www.cheapgraphicnovels.com offers the same or better discounts 24/7 as well. 5. As a retail store owner what is the most difficult thing you wish you could change in this industry? It’s been said way too many times but probably delays.A delay on a high profile book like Blackest Night or Siege won’t impact sales on that book but a delay on a small indie book will just drive it into the ground and absolutely kill sales. 6. How long have you been involved with comics? The store has been open for almost 6 years but comics have almost always been a part of my life. 7. How do you feel about CGC and graded books?As a fan are you for or against it?As a retailer do they sell in your store? There’s nothing wrong with CGC and other graded books; it’s just another level of collecting that some fans are in to and some are not.Some fans spend 30 minutes in the store each week checking every book to make sure they get the most pristine copy and some don’t so it’s all just a personal preference.We do sell some graded books in the store but they’ve historically sold much better for us online. 8. 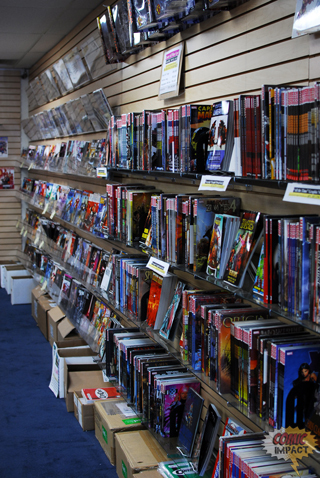 Where do you see the comic book retail business in 5 years? All of the recent developments in the digital realm as well as the decreasing prosperity of the print newspaper and magazine industries does make me worry, but I think we’ll be fine.I believe that there will always be people who want to hold a physical product in their hands when they read it and this is especially true with comics.There’s also the collectable factor to consider; it’s certainly more fun to collect physical comics that can become scarce than a digital file. 9. How does your store deal with collectibles such as statues and figures?Is it more of a special request item or is the average fan still interested in them? We like to carry a wide variety of statues and figures but we will also pre-order anything for one of our customers. What’s great about these types of items is that often someone who just wanders into the store will be more attracted to a cool looking statue or figure than a comic but they also greatly appeal to our regular customers.My favorite collectible we’ve carried lately is the special metal display stands we had custom made for the promotional Blackest Night rings.I also love displaying the small-scale Marvel and DC lead figurines. 10. What is the average age of your customers? Most of our pull customers are college age and older but we do have a lot of younger kids come in.The most popular comic with kids at our store is Sonic the Hedgehog. 11. As a retailer do you still have the luxury of being a fanboy and do you still get giddy when you read your favorite books? Although the daily responsibilities of the store often hamper my ability to read everything I’d like to, there are still books I can’t wait to at least flip through as soon as they come in. A lot of people that wander in are surprised that we’re there and ask how long we’ve been in business. 13. 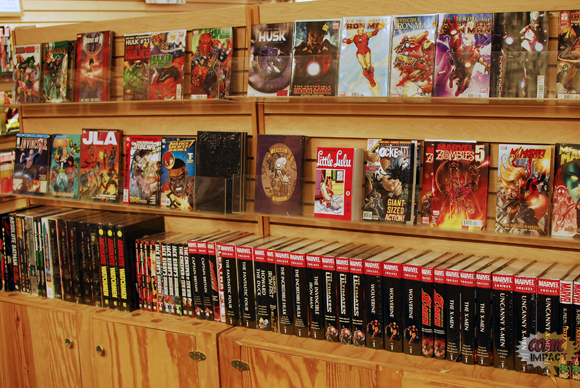 If someone walks into your store and says, “Hey, I want to get into comics” what would you recommend to them? Well it depends on what they’re interested in which is always the first question.Do they want superhero comics?If so, do they want something Marvel/DC or something else?How about crime? Science fiction?It all depends on their interest. 14. What are some of your favorite current books?Does it influence sales in your store? Uncanny X-Men, Invincible Iron Man, The Walking Dead, Invincible, Ultimate Avengers, Ultimate Spider-Man, Amazing Spider-Man..too many to list.We have featured three featured books each week so I’d have to say my opinion actually does influence sales although I try to feature new #1s and other important releases and not just my personal favorites. The best run in comics history is the Claremont/Cockrum/Byrne run on Uncanny X-Men and the best current book that I’m always excited to read is The Walking Dead.